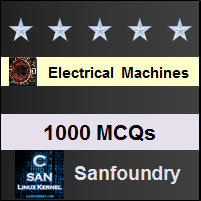 This set of Electrical Machines Multiple Choice Questions & Answers (MCQs) focuses on “Power Angle Characteristics of Synchronous Machines”. Explanation: In the generator mode, the power is positive and it is taken out of the terminals. Explanation: P = EV/X = 1.2*1/0.5 = 2.4 pu. Explanation: P = EVsinδ/X = 1.1*1*sin36.67 = 6.6 pu. 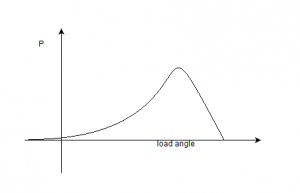 Explanation: The power angle curve is not completely sinusoidal due to the salient nature of the poles. 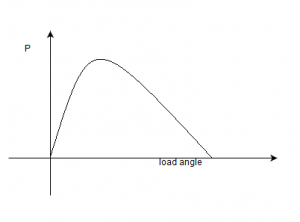 Explanation: The reluctance power generated will be proportional to sin(2δ). Explanation: The net reluctance power for a cylindrical rotor type alternator will be zero if the field excitation is made zero. Explanation: The net reluctance power for a cylindrical rotor type alternator will be zero if the field excitation is made zero. There will not be any torque generated. 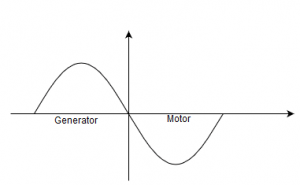 Explanation: The total reactance will be the reactance offered to the synchronous motor in the machine. 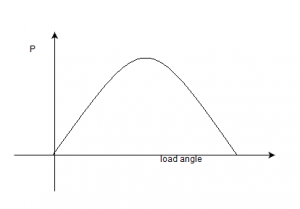 Explanation: The maximum power will occur at exact 90° for a cylindrical rotor alternator. 10. 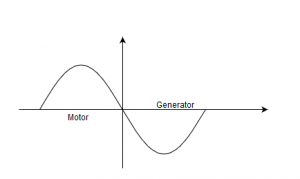 A synchronous generator is operating with a Ef=1.40pu. This machine having Xs of 1.2pu, is delivering a synchronous power of 0.5pu to the bus. If the prime-mover torque is increased by 1%, by how much will the synchronous power P change? So the change in P will also be 1%. 11. 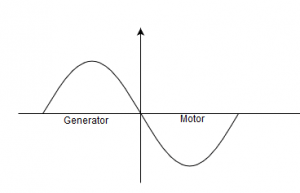 A synchronous generator is running over excited with a Ef=1.40pu. This machine, with a synchronous reactance of 1.2pu, is delivering a synchronous power of 0.5pu to the bus. 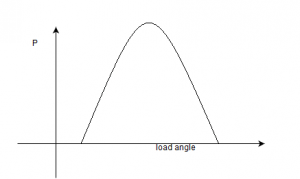 If the prime-mover torque is increased by 1%, by how much will the reactive power, Q change? Explanation: Due to the condition here that it is providing the real power to the infinite bus bar here, the machine will need more flux to produce the real power in the machine. Explanation: The phasor addition is possible due to the fact that the two mmfs are stationary with respect to each other. Explanation: The hunting is damped by the copper losses in the rotor.